Research and Publications Section is charged with the responsibility of administering research funds, postgraduate funds, donor funds, internal and external grants and handling of research associates. It is also responsible for publications, documentation and dissemination of research outputs. The strength of SUA in research is based on a large number of highly trained agricultural and natural resources manpower in the country. Currently, there are about 240 qualified researchers and out of these about 170 are PhD degree holders who normally undertake both basic and applied research. In addition to academic members of staff there are also a total of 280 postgraduate and more than 2000 undergraduate students who also contribute significantly to the University’s research efforts and achievements. Furthermore, there are also about 70 well-trained technicians that provide the supportive services on technical matters. The names and qualifications of these scientists are published annually in the University Prospectus. The University has well equipped laboratories with ample space in almost all disciplines of agricultural sciences. In addition, researchers and students have access to the Internet services in the University. The other facilities include 3,350ha of land for research and production in Morogoro, 840 ha of forest land in Arusha for research and production and about 320 ha of virgin forest for research in Usambara mountains near Tanga. 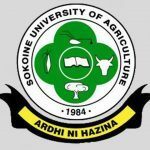 SUA hosts the Sokoine National Agricultural Library which serves both as a university library for Sokoine University of Agriculture (SUA) as well as a national agricultural library for Tanzania. The library holds about 100,000 volumes of books and periodicals. The Library Catalogue can be searched through the Internet. In addition, the library holds a number of CD-ROM databases, and provides Internet services including access to full text journal articles on agriculture and allied sciences. SUA has been undertaking research in farming systems, intercropping, agroforestry, dairy goat improvement, bovine parasitic otitis, tick and tick borne disease control and identification and control of helmintic diseases of livestock and poultry, studies on epidemiology of CBPP and TB, and in crops. From these research undertakings a number of achievements have been recorded. For example: SUA’s bean improvement project has released high yielding varieties like SUA 90 and ROJO, which have a lot of potential in smallholder bean production systems. SUA has made improvements in the production systems for vegetable crops and dairy goats and cattle in highland areas with land scarcity. SUA has also contributed towards improving the delivery of extension services in Morogoro and other regions through various extension and outreach programmes. Identification of rice varieties which are resistant to Rice Yellow Mottle Virus (RYMV). Identification of lesser known hardwood tree species that reduce harvesting pressure on the traditional hardwood species now threatened with extinction. Mapping out the spatial distribution of important diseases of livestock in the country including the devastating lung sickness (CBPP) of cattle, Bovine tuberculosis. Introduction of heat resistant vaccine against Newcastle, a killer epidemic of rural chickens. Development of technologies for removal of toxic cyanogenic compounds from cassava by sun drying and water soaking. Selection and breeding of sweet potato cultivars that are resistant to sweet potato weevil. The use of local farmers knowledge as an effective complement to the classical scientific methods on classification farm soil, classification of landforms and land use. The approach has proved useful in optimising land use, conservation efforts and crop yields especially in the rural areas of the Kwimba, Misungwi (Lake zone),Mbulu and Karatu. Strengthening of non-agricultural activities as a tool for alleviation of rural poverty. Integrated biosystems for small holder farmers involving recycling of animal wastes, introduction of nitrogen fixing trees like Gliricidia sepium in agrosilvopastoral system that has proved effective in the intensification of zero grazing system of livestock production. Intercropping as a way of controlling crop pests, where the maize-cowpea intercropping has resulted in higher crop yields than has been the case for monocultures. Community based management of forests, a practice that has proved useful in the conservation of the diversity of indigenous medicinal plants. Database development for hardwood plantations in Tanzania. Establishment of the insect diversity and abundance in Mazumbai Forest reserve as a source of baseline data in the unique ecosystem. Plant domestication in East Usambara as a technique to enhance biodiversity conservation and releasing cropping pressure on natural forests. Identification and control of bacterial contaminants in food of animal origin. Characterization of variant forms of rabies in domestic animals. Improvement of production and management of rural chickens as a tool that has contributed significantly to alleviation of poverty in rural areas. Using vascular permeability antagonists in the management of pulmonary oedema (accumulation of water in the lungs) as a method of reducing ECF related mortality losses in cattle. Tapping fetal Oocytes as a resource for optimising on embryo transfer techniques in cattle production. Development and application of local microbial strains in the detoxification and degradation of cyanide in cassava. Where Bacillus spp, Lactobacilus spp, Corynebacteria spp. Candida spp and Aspergillus spp potentially useful for the purpose have been isolated. Variety improvement of rice through mutation breeding at SUA. Improving the fruit yield of pawpaws by inducing artificial branching at an early stage of plant growth. Development of extracts of medicinal and insecticidal value from the Neem. This includes preparations against some parasitic helminthes of domestic animals and repellents/insecticide against fleas and tsetse flies. Application of PCR and DNA probes in characterization and diagnosis of Trypanosomosis in cattle. Extraction of juice from sweet potato and other non traditional juice fruits. Tempe: An inexpensive weaning/supplementary feed developed by bioenrichment of techniques using local, underutilized legumes, oil seeds and cereals. Fabrication of a pilot model of an in-plastic sachet pasteurization unit for small scale milk processing, a technique that promises to increase shelf life of milk at room temperature. Development of an incubator/hatcher powered by biomass energy such as heat from combusted rice husks, saw dust and dried animal dung. Introduction of oxen in plantation forests for skidding logs. This has resulted in minimum environmental damages, use of locally available resources and creating employment for rural people. Improvement of crop residues to serve as source of animal feed especially for the dry season in rural and peri-urban areas. Where for instance wood ash on stover has been shown to significantly improve the nutritive value of maize stover. Introduction of planted multipurpose tree/shrubs in rural areas, an innovation that has resulted in better soil conservation practices, improved fertility, as well as more food and wood for resource poor farmers. Agroforestry practices using short fallows of planted trees/shrubs and relay cropping technologies as alternative to traditional shifting cultivation in semi arid areas. The innovation has resulted in improved soil fertility and increased crop yields. At Gairo in Morogoro rural district, the use of Tephrosia spp, Cajanus cajan, Gliricidia and Sesbania sesban tree shrubs has increased maize yields up to 4.4 tons per hectare. Improvement of dairy production and management through artificial insemination practices and farmer managed mastitis control practices. Tie ridging as a rainwater harvesting technique that has improved crop yields in semi-arid areas of central Tanzania. Adoption of the Ngoro farming system of the Matengo as a technique for soil conservation and soil fertility management in Uluguru Mountains. Fish farming along streams of the Uluguru mountains. The method has improved household food security and income in some villages in Morogoro rural district. Use of planted trees/shrubs like Leucaena leucocephala, Morus alba and Clotaralia spp as a source of protein supplement for domestic animals. Use of elephant grass in the control of soil erosion in Kondoa, a practice that has proved effective in sand river stabilization. Identification, evaluation and utilization of natural forages in Mbinga highlands. Use of draught animals for hauling agricultural farm inputs and farm products to the market. About 98% of the research projects undertaken at SUA are externally funded through signed agreements between individual researchers, departments or University in general on one hand, and the funding agencies on the other hand. The other 2% is funded by the Government of Tanzania and internal public and non governmental organizations. All Government funded research projects and where research funds are channeled through the University by the funding agencies, applicants have to apply for research funds by using the standard Application for Grant form ( R&P 001 ). Successful researchers have to submit regular progress reports by filling Progress Report form ( R&P 002 ) to Senate through Senate Research and Publication Committee (R & PC). At the end of the research project, researchers are also required to submit terminal reports by filling Terminal report form ( R & P 003 ). Application and reporting procedures for research projects not administered by the University through SR&PC vary depending on the signed agreements between the funding agencies and the individual researchers or department. Where research funds have to be administered by the University, an Administration fee of 5 percent is charged for each project. The amount of funds spent on research is estimated to be about TAS 2.0 billion per year. Currently the Norwegian government through NORAD is funding about 50% of the research projects at SUA. The list of agencies funding research at SUA are normally printed biannually in SUA Research Newsletter published by DPRTC. Researchers at SUA publish research results or findings in both local and international scientific journals. A good number of SUA researchers are members of the Editorial Boards of reputable scientific journals both locally and internationally. Most of the local journals in the agricultural sciences are based at SUA. In addition to publishing in scientific journals, SUA researchers also present research results in local and international Conferences and Workshops. Most of the proceedings of these conferences are printed and distributed widely.